We are fragrance junkies here at BeautyEQ, and when a new bottle arrives, it's always a guessing game to see who we think it will suit. It's safe to say we are all start stuck with the latest from Versace. Editor Trudi Brewer shares why. Versace Pour Femme Dylan Blue. One of the best representations of a juicy, fruity floral fragrance, which by the way is this season's must-have scent, would have to be Versace's latest. This creation is on fire and was designed to suit a strong, sensuous fragrance for women who know their power - that sounds a lot like us. It's crammed with delicious, fruity aromas from granny smith apple, blackcurrant, peach, with a dash of zesty grapefruit. Which quickly fades to show off the delicate floral notes such as forget-me-nots, jasmine, rose and subtle Petalia that given a spicy kick courtesy musk, patchouli and white woods. 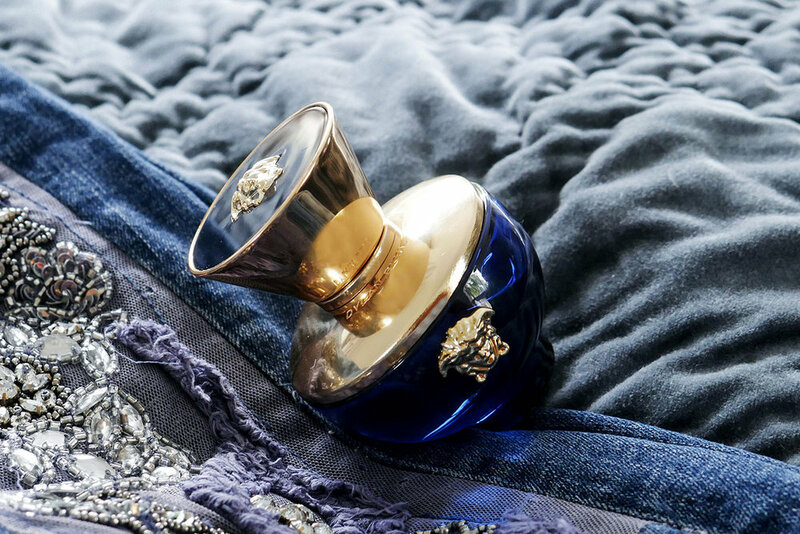 Firstly the name we immediately fell for, followed by the deep sapphire and gold bottle. I am more inclined to covet a pure, translucent glass vessel, but the luxury of this elegant Greek-inspired bottle with the iconic Versace Medusa emblem stamped on the lid gives it a very regal appeal. And the face behind the fragrance, an essential aspect of the Insta-worthy world we live in, Croatian model Faretta Radic who told media recently. "This fragrance is created as a tribute to strong, independent women who are aware of their own power. Dylan’s floral-fruity and woody composition emphasise uniqueness, strength, sensuality, and elegance in those who dare to wear it." Model Faretta and face of Dylan Blue Pour Femme.